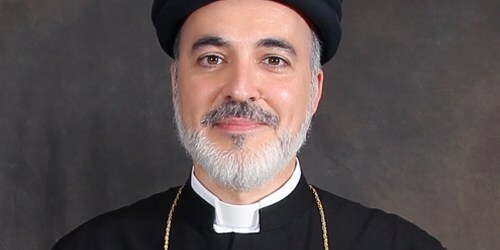 His Grace Mar Awa Royel is the Bishop of California, Secretary of the Holy Synod and President of the Commission on Inter-Church Relations and Education Development (CIRED). He Grace was consecrated to the episcopacy at Mar Zaia Cathedral, Modesto, California in November 2008. A native Chicagoan, His Grace graduated with a Bachelor of Sacred Theology from the University of St. Mary of the Lake, Mundelein, Illinois in 1999. He later undertook postgraduate theological studies in Rome graduating with a Licentiate of Sacred Theology (2001) and a Doctorate of Sacred Theology (2007) from the Pontifical Oriental Institute, specialising in Eastern Liturgy. He also represents the Assyrian Church of the East as a member of the Forum Syriacum (Pro Oriente Foundation, Vienna) and has been active in a wide variety of international symposia and ecumenical consultations to date. His Grace’s latest publication is Mysteries of the Kingdom: The Sacraments of the Assyrian Church of the East (California: CIRED, 2012). The question of the Church’s Christological expression finds its roots in the question of the Lord Jesus posed to his Disciples in Caesarea of Philippi: “Who do you say that I am,” Matthew 16:15. That is really at the foundation of every, and any, discussion concerning how the Church confesses the one Son, Jesus Christ. The response of Peter, “You are the Christ, the Son of the Living God” constructs a framework for later Christological expressions of the Church. Later, one of the Lord’s Post-Resurrection appearances, the apostle Thomas equally gives a highly Christological expression to the Risen Lord whom he experienced and truly handled after the resurrection—“My Lord and my God,” John 20:28. In the Synoptic Gospels, the blessed Evangelists speak of Jesus ‘Son of God,’ ‘Christ’ and ‘Lord’ ( ܡܪܝܐ Marya in Aramaic, or Kyrios in Greek), while the Johannine tradition is more emphatic in its expression of the Eternal Son as ‘Word’ (or ܡܠܬܐ Meltha)—Logos—the very Mind and Wisdom of God. Theologians will speak of a ‘Christology from Below’ (identifying the Synoptic Gospels tradition) or a ‘Christology from Above’ (in reference to the tradition of St. John, the Beloved Disciple). Although the Gospels express a christological faith that is complete and sufficient in its own right, the emergence in the early centuries of the Church of various heresies which denied either the complete humanity of Christ (such as Docetism of the late third century and Apollinarianism of the early fourth century) or the Lord’s complete and true divinity (such as Arianism of the early fourth century) necessitated an expounding of the pure and simple Christological expressions of the New Testament. The influence of Hellenistic culture and the use of philosophy by the early Fathers of the Church also contributed to the development and growth of a Christological parlance and expressions that were much more complex than the Christology expressed in the New Testament texts. The apostolic kerygma, therefore, is foundational for dogma—the Church’s official expressions and formulas of faith; without the apostles, there can be no apostolic faith, nor can there be an Apostolic Tradition, as such. Without the living Tradition of the apostles, there can be no valid apostolic expression. This living Tradition of the apostles, in turn, is outwardly expressed and experienced by the faithful in the Church’s life of worship and prayer—her Liturgy. For the Assyrian Church of the East, the main liturgical formulary is the Khudra, or ‘Cycle,’ which contains the offices and prayers for all Sundays of the liturgical year and the Feasts of our Lord and commemorations that are observed on Sundays. [the Khudra] contains the variable chants of the choir for the divine office and the Mass for the entire cycle of the liturgical year. The compilation of the Khudra is traditionally attributed to the Catholicos Patriarch Išo‘yahb III of Adiabene (648/9-648/9) and his collaborator, the monk ‘Enanišo‘, and there is no compelling reason for doubting he attribution. We have already discussed the redaction of the Khudra initiated by Išo‘yahb III, whose liturgical reforms actually began while he was yet metropolitan of Adiabene. The fact that the recension of the Khudra standardized by Išo‘yahb while he was already patriarch, residing at the Upper Monastery, has gained for the name of this formulary, “according to the order of the Upper Monastery of Mar Abraham and Mar Gabriel at Mosul.” The manuscript tradition almost always refers to this work as the “Khudra dam-dabranootha,” i.e., the Khudra ‘of the dispensation.’ This refers to the whole liturgical year, with its different seasons and feasts in between, as celebrating the divine economy or mdabraootha—the economy of salvation authored by God the Father and realized in his Son, Jesus Christ. …was a commentary on the ceremonies of the eucharist, daily office and other liturgical rites. This work seems to have given a theological rational for the liturgical actions. The theological explanation given to the liturgical actions by an influential patriarch invested them with ‘a sacrosanct quality to change.’ This liturgical commentary, now lost, is used in an anonymous commentary on the anaphora and other liturgical ceremonies probably written in the ninth century. The so-called penqīthā of Išo‘yahb is also mentioned by ‘Abdišo‘ of Nisibs in his Catalogus Auctorum. Concerning the writings of Išo‘yahb he mentions that he ordered the penqīthā d- Khudra, or the ‘volume of the Khudra.’ Here the understanding in clear—the penqīthā and the Khudra are one and the same volume. It is highly likely that even after the period of Ezekiel’s pontificate (570-581), the Khudra was in fact referred to as the Penqīthā, and that its name was changed most probably by Išo‘yahb III once elected patriarchate, the reason being the aversion of the Church of the East to a name which the West Syrian ‘adversaries’ were utilizing for their main prayer book as well and a need to distinguish themselves from the ‘heretics.’ In conclusion, upon noting that the West Syrian equivalent to the Khudra is in fact a huge volume referred to as the Fenqīthō, and that there are many rubrics contained in the Khudra itself, one is led to believe that in fact, the penqīthā of Išo‘yahb and the Khudra are one and the same. The final formative period of the Khudra comes with the redaction of the Catholicos-Patriarch Mar Elia I (1028-1049). The Khudra underwent a revision sometime around 1250 AD. According to Adolf Rücker, the last of the most famous master of the Upper Monastery to be mentioned by name was Mar Yahb’Alaha II (1190-1222); it is most likely that this reform of ‘around 1250’ mentioned by George Percy Badger is in reference to this patriarch. The Christology of the Khudra is expressed, obviously, in the ecclesiastical compositions of this liturgical formulary. The very opening of the Khudra, which begins with the four Sundays of the Annunciation (Subara), in the first ‘Antiphon of the Basilike’ (ܥܘܢܝܬܼܐ ܕܒܼܣܠܝܩ̈ܐ), which is the main vesperal antiphon for Sundays, Feast Days and Commemorations, begins on a very high note, christologically speaking. The ecclesiastical compositions for the opening of the liturgical year recall the dispensation of God which was begun in Abraham, with whom the promises concerning the Christ began: “God the Word [who is] from the Father, did not take the form of the servant from angels but from the seed of Abraham. And He came [by means of] or humanity in His goodness, that He might save our race from error.” The first of the Old Testament readings is, in fact, very much tied to this antiphon, for all of Genesis 17 is to be read. It recalls the election of Abraham and the giving of the Covenant and its sign (between God and Abraham) to his and his children after him. The christological expressions of the Khudra are for the most part simple, yet theologically rich. The main focus is the duality of the natures, in keeping with the strict diaphysite christological creed of the Church of the East, and the unity of the natures of the Godhead and humanity in the one person of Sonship. The classic hymn ‘Blessed is the Compassionate One’ (ܒܪܝܟܼ ܚܢܢܐ) by Mar Babai the Great (ca. 551-628) is really the only ecclesiastical composition in the Khudra which expresses in a liturgical manner the Church of the East’s position concerning the duality of Qnoma in Christ. The ecclesiastical compositions of the Khudra very rarely make use of the term Qnoma in the antiphons. The duality of natures in our Lord Jesus Christ, yet stressing the unity of the natures in the one Son of God is of essential importance. ‘Qnoma’ is defined as “individual nature” or “unique nature.” In his synodical letter which deals with Christology, Patriarch Mar Isho’yahb II of Gdhala (628-646) speaks about the meaning of Qnoma in the Christological position of the Church of the East. He became patriarch in the very year that Mar Babai the Great died (i.e. 628); he is the well-known author of the Book of Union (ܡܐܡܪ̈ܐ ܕܡܪܝ ܒܒܼܝ ܥܠ ܐܠܗܘܬܼܐ ܘܥܠ ܐَܢܫܘܬܼܐ ܘܥܠ ܦܪܨܘܦܐ ܕܚܕܝܘܬܼܐ). Babai the Great is the first to formally express the Church of the East’s Christological formula of two natures (ousia), two qnoma and one person of Sonship. See John 1:1; I John 1:1. ‘Docetism,’ from the Greek dokein (meaning, ‘to appear/seam’) was the heresy that arose first in the letter of Serapion of Antioch (bishop 197-203), who held that Jesus only ‘seemed’ to be human and that his physical body was only a phantasm. Apollinaris of Laodicea (died 390) held that Christ did not have a human mind, but a human lower soul and a divine mind. Along with Eutychianism, Apollinarism is the extreme form of monophysitism. ‘Arianism’ was the heresy espoused by Arius, a presbyter of Alexandria (ca. 250-336). He held and taught that Christ as the Son of God did not always exist (eternally) with the Father, but was created, and as such distinct from the nature of the Father. Thus, for Arius the Father was greater than the Son (an idea based on John 14:28). Arius’ teaching was condemned as heretical at the first ecumenical council of Nicea (325), and the condemnation was reiterated at the second ecumenical council of Constantinople I (381). The Khudra was printed between the years 1960-62 in Thrissur, Kerala, South India by the Mar Narsai Press and with the express permission of the late His Holiness Mar Eshai Shimun XXIII (1908-1975), Catholicos-Patriarch. This being the first Assyrian edition of this liturgical formulary, the other two liturgical books—the Gazza (containing the offices for feasts of our Lord and commemorations of the saints which are not based on the Sunday-cycle) and the Kashkul (containing the propers for the night, morning and evening offices for the ferial days, excluding all Sundays, feasts and commemorations)—were combined into one volume, and are now collectively referred to as the Khudra. Hereafter abbreviated as Khudra. Stated by Prosper of Aquitaine (ca. 390-455), in the eighth book of his concerning the grace of God and free will: “Let us consider the sacraments of priestly prayers, which having been handed down by the apostles are celebrated uniformly throughout the whole world and in every catholic Church so that the law of praying might establish the law of believing.” See Patrologia Latina 51:209-210. Cf. W. C. Van Unnik, Nestorian Questions on the Administration of the Eucharist by Isho’yahb IV (Haarlem 1937; reprinted Amsterdam 1970) 148. See: A. Baumstark, Geschichte der syrischen Literatur mit Ausschluss der christlich-palästinensischen Texte (Bonn 1922) 198. W. F. Macomber, “A List of the Known Manuscripts of the Chaldean Hudra” Orientalia Christiana Periodica 39 (1973) 275-306; Idem., “The Oldest Known Text of the Anaphora of the Apostles Addai and Mari” Orientalia Christiana Periodica 32 (1966) 335-371; cf. Idem., “A History of the Chaldean Mass,” Worship 51 (1977) 112. Cf. B. Varghese, “East Syrian Liturgy During the Sassanid Period,” Harp 15 (2002) 216. It seems that an even older extant Khudra exists in the collection of the Syriac and Soghdian Christian manuscripts found at Turfan. For my discussion this Khudra fragment, possibly older than the Mar Esha’ya manuscript by one century, see my forthcoming article: “From Mosul to Turfan: The Hūdrā in the Liturgy of the Assyrian Church of the East. A Survey of its Historical Development and its Liturgical Anomalies at Turfan.” Lecture delivered at the VIII Christianity in Iraq Seminar Day, May 2011, at the School of Oriental and African Studies, University of London. My thanks to Dr. Erica Hunter for her invitation and for providing me with digital copies of the Turfan fragments. W.F. Macomber, “Manuscripts of the Hudra,” 120-121. For a description of the contents of the Mar Eša‘ya Khudra see: P. Yousif, Appunti sulla preghiera liturgica del rito caldeo (commune) [= Notes on the Common Liturgical Prayer of the Chaldean Rite], (unpublished class notes at the Pontifical Oriental Institute, Rome 1982-1983) 3. Cf. E. Tisserant, “(L’Église) nestorienne,” Dictionnaire de Théologie Catholique, vol. 11.1 (Paris 1931) column 319. Cf. A. Baumstark, Geschichte, 198. See for example manuscript Borgia Syriac 150 (fol. 1r) and Borgia Syriac 85 (fol. 1r). See Earnest A. W. Budge, The Book of Governors: The Historia Monastica of Thomas, Bishop of Margâ A.D. 840, volumes I-II, London 1893. R. H. Connolly (editor & Latin translation), Anonymi Auctoris Expositio Officiorum Ecclesiae Georgio Arbelensi vulgo adscripta. Accedit Abrahae Bar Lipheh Interpretatio Officiorum, vols. I-II. Corpus Scriptorum Christianorum Orientalium 64, 72 – 71, 76 = Scriptores Syri 25, 29 – 28, 32, Paris-Rome 1913, 1915; reprinted Louvain 1960-1961. Hereafter abbreviated as EOE I/II. See J.-M. Fiey, “Išo‘yaw le Grand. Vie du catholicos nestorien Išo‘yaw III d’Adiabène (580-659), Orientalia Christiana Periodica 35-36 (1969-1970) 11; P. Yousif, Appunti sulla Messa caldea [= Notes on the Chaldean Mass], (unpublished class notes at the Pontifical Oriental Institute, Rome 1982-1983) 15. Cf. BAUMSTARK, Geschichte, 198. VARGHESE, “East Syrian Liturgy,” 217-218. J.S. Assemani (editor & Latin translation), Bibliotheca Orientalis Clementino-Vaticana de Scriptores Syri, vols I-III/1-2 (Rome 1719-1728; reprinted Hildersheim/New York 1975; Piscataway, NJ 2002) vol. III/1, 139.
 f. 94r: ܘܕܥ ܐܘ ܡܪܝ ܩܪܘܝܐ. ܕܘܟܼܪܢܐ ܕܚܕ ܦܪܨܘܦܐ ܘܡܬ݂ܝܕܥ ܕܡܪܝ ܐܒ̣ܐ ܩܬܼܘܠܝܩܐ؛ ܕܒ̣ܦܢܩܝܬ̈ܐ ܥܬܝܩܬ̈ܐ ܕܡܪܝ ܒܪܨܘܡܐ ܕܨܘܒ̣ܐ ܪܫܝܡ. ܒܪܡ ܚܙܩܝܐܝܠ ܩܬܘܠܝܩܐ ܣܡܗ ܠܐܝܩܪܐ ܕܚܕ ܦܪܨܘܦܐ. ܘܐܝܬ̣ܘܗܝ ܕܡܪܝ ܐܒ̣ܐ ܩܬܘܠܝܩܐ ܪܒܗ. W.F. Macomber, “Manuscripts of the Hudra,” 122-123; Idem., “Oldest Known Text,” 342. Cf. A. Baumstark, Geschichte, 198. The Syriac text of all of these rites may be found in J.E.Y. KELAITA (editor), The Liturgy of the Church of the East, Mosul 1928. Based on information “according to the historical notices found in the prefaces to this [Khudra] ritual…made in the Deir Alleita…;” see G.P. Badger, The Nestorians and Their Rituals. With Narration of a Mission to Mesopotamia and Coordistan in 1842-1844, vols. I-II (London 1852; reprinted London 1987) vol. II, 22. Badger does not cite the alleged manuscripts from which he has extracted this historical note. Cf. D.G. Bickel, Conceptus rei Syrorum literariae (Munich 1871) 88; J. Moolan, “The History and Structure of the Syro-Malabar Liturgical Seasons,” Christian Orient 25 (2004) 89. A. Rücker, “Das ‘Obere Kloster’ bei Mossul and seine Bedeutung für die Geschichte der Ostsyrischen Liturgie” Oriens Christianus, third series, 7 (1932) 181 note 2; cf. C. Van Unnik, Nestorian Questions, 149. See the Syriac text in: A. Vaschalde (editor), Babai Magni: Liber De Unione, Corpus Scriptorum Christianorum Orientalium 79 = Scriptores Syri 34, Louvain 1915. The English translation of this text, made by the late Cor-bishop Michael J. Birnie (†2013) with an introduction by S.P. Brock, is in preparation by the Assyrian Church’s Commission on Inter-Church Relations and Educational Development (CIRED), and is due to be published late 2013/early 2014. Founder of a monastery in the village of Ba Mada, near Mosul, who lived during the patriarchate of Mar Isho’yahb I of Arzon (582-595). The Syriac Synodicon was edited with a French translation by J.B. Chabot in 1902. However, this letter of Mar Isho’yahb II is omitted in Chabot’s edition. For the Syriac text and French translation see: L. R. M. Sako (editor & French translation), Lettre christologique du patriarche Syro-Oriental Īšō’yahb II de Gdālā (628-646). Étude, traduction et edition critique, published doctoral dissertation, Rome 1983. ܥܘܗܕܢܐ ܕ92 ܫܢ̈ܐ ܠܣܗܕܘܬܐ ܕܡܪܝ ܒܢܝܡܝܢ ܫܡܥܘܢ Is the Theology of the Assyrian Church Nestorian?